Prepare for some pretty adorable fabric. Vintage Lace fabrics is running their Valentine's Day flash round and everything is so stinkin' cute. My boys look cute, I feel cute, the leftover scraps littering my floor are cute. It's all CUTE. Just be prepared. Ha! 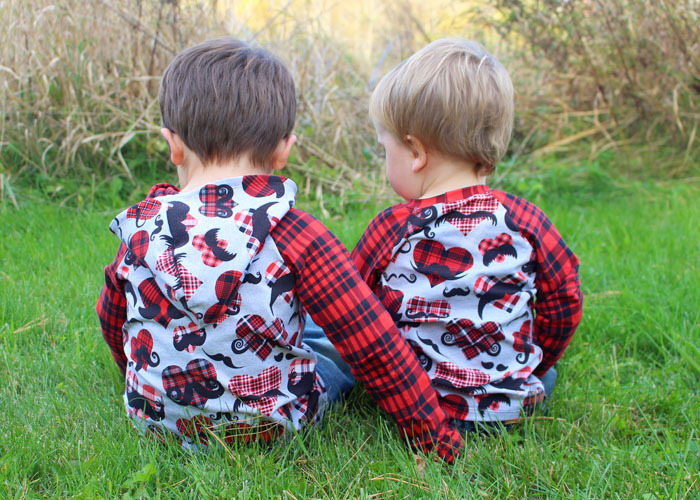 I sewed up my boys' goods first: Plaid About You, and a coordinating plaid called Easton,both in cotton Lycra. I mean, are they adorable, or what?! It's HARD getting a nice picture of a 2 year-old and a 3 year-old together. Thus the "sit next to each other and just look at the field while I take a picture of your back, I don't care what face you're making" picture. 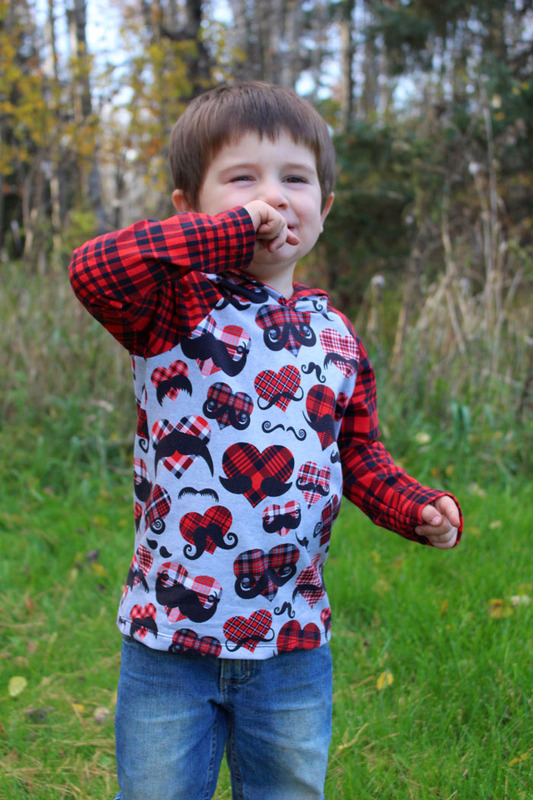 Grant was especially loving this fabric-- he thought the mustaches were hilarious, and he ran around making a finger mustache and laughing deviously. Annnnd, since baby boy #3 is due at the end of January, of course, I had to make him a little outfit too! I'm going to have the most adorable troupe of Valentines this year! Baby's outfit is the Muse playsuit from Stitch Upon a Time. I love a sleeper with no feet because I'm a little obsessed with babies in moccasins. I just got done doing a sew along of the Muse, so I actually made EIGHT of these sleepers last week! Okay, now on to the selfish sewing for this pregnant mama! I'm 25 weeks this week, so my bump is more than a little noticeable now. I've kind of been in denial these past few weeks, but there's really no getting around it anymore, haha. I got a little bored with all the rouching for maternity shirts, so I decided to play around with some different patterns. 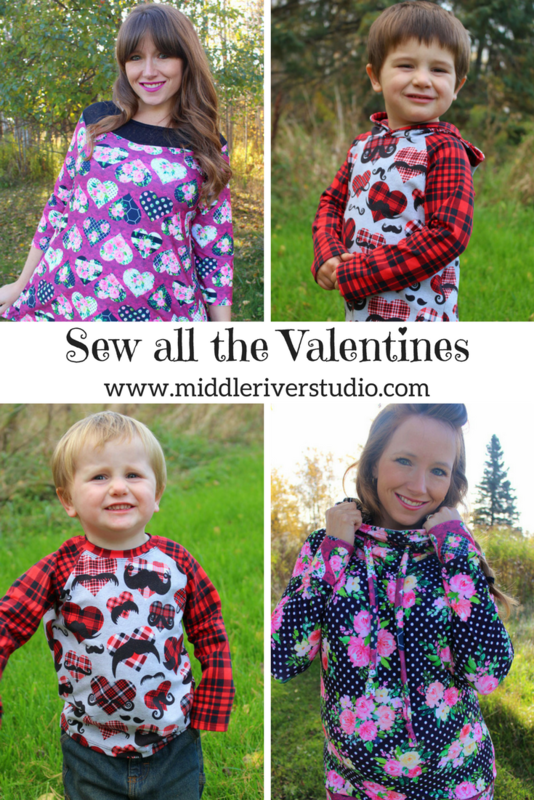 I'm crazy about this heart fabric-- I had SO many ideas for it! I ended up going with the Splitsville from George and Ginger. With the open back, it's REALLY forgiving through the first and second trimesters as your bump grows. I had a tank in this pattern that I wore all summer long, with no mind to my bump. This is my pre-pregnancy size, and you can see it's just starting to get too tight now at 25 weeks (see the pulling at the top of the split?). I was wondering how this pattern would work backwards now that my belly is getting bigger, so I did make a few changes. I lowered the neckline of the back, to make it reversible. I also took a half inch off the fold of the top of the back piece (the black onion skin fabric), so that I wouldn't have a seam down that piece. So, worn with a tank backwards, I don't see a reason why this wouldn't fit well through the rest of my pregnancy! I've been wearing Splitsvilles for so long though, that I can't help but feel like I'm wearing a backwards shirt . . . but I know I got a few comments from people that they actually like it better backwards! Also, this would be a super comfy and easy nursing shirt! Speaking of nursing, I decided to make my first ever nursing pullover from the remaining cuts of Vintage Lace fabric I received (and seriously, look at how much fabric team VL sent me! They are SO generous with their strikes, and they're honestly among the sweetest people I've gotten to sew for). 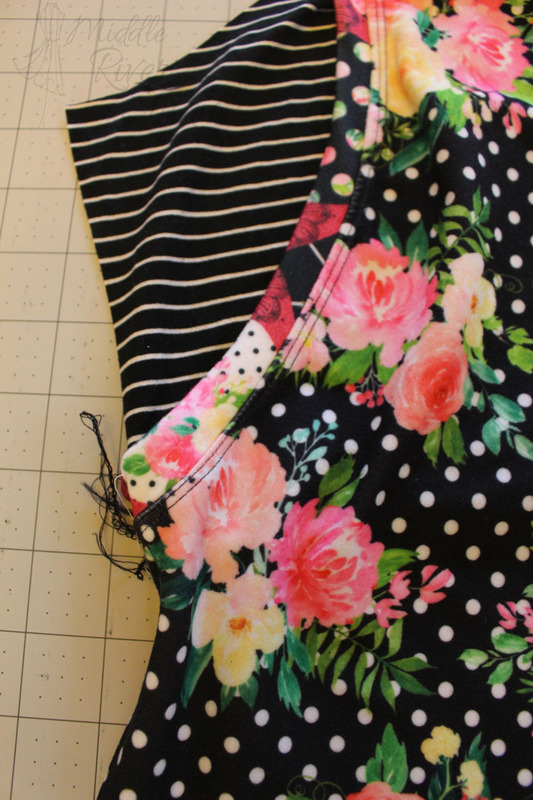 This is the Sophia Floral Polka Dots, with a little of the leftover Sophia Hearts for the bands, and some extra black and white striped brushed poly scraps I had laying around. And I'm SO happy with how this turned out-- I was a little nervous making the cuts, but I LOVE how it turned out. Honestly, it looks like a normal shirt from the front! The side view shows off the nursing modification a little bit better (see the striped fabric on the side of my bust?). I used the Slim Fit Raglan from Patterns for Pirates-- looking a little less slim at the moment, haha! But, the ladies at Vintage Lace were so kind to send me their brushed poly for these prints-- it's super soft and lush (the thickest around, I swear! ), and the stretch is SO nice for a growing belly. And, here's how that nursing mod works! Whoa! Talk about easy access! And it really was simple to execute. I've looked at quite a few nursing mods, but for a hoodie, I like this one. I actually started with this Patterns for Pirates post as inspiration. You make a second front piece (that's my striped fabric). I used coordinating fabric, but you could use the same fabric if you wanted it to blend in more. When considering the cuts I used, remember that you may need to adjust yours based on your height and cup size. For reference, I'm 5'4", with a D/DD cup, and am wearing a Patterns for Pirates size large. This piece is shorter than the real front piece-- I cut mine at 6.5 inches from the armpit. It is also narrower. I took 1/2 inch off the fold (so 1 inch total narrower). This is so it's a little tighter and stays closer to my body. I banded the bottom raw edge. I used a piece that was 2 inches by (width of front piece minus 1 inch). While folded, I cut that deep 'V' in the middle. The bottom of the V is 2 inches from the raw edge of the undershirt. I left 1.75 inches of the neckline on each side. And, here's what it looks like from the front! You can see that before I basted the pieces together, I cut the swoops on each side. I left 4 inches on the top of the front armsyce, and extended the swoop down to 6.5 inches below the armpit. You could turn and top stitch the raw edge on the scoop, but I chose to band it, and top stitch the seam allowance. Once the two pieces are basted together, proceed like normal for the rest of the pattern instructions! I didn't have enough fabric to make this into a hoodie, but I still wanted the feel of a hoodie, so I cut this funnel collar instead. Basically, it's two pieces (a front [the polka dots] and a lining [the stripes]), that are each 10 inches by 100% of your neck opening (mine was 28.5 inches) plus seam allowance. It's my favorite easy cheat when I'm low on hood fabric. This family will be ready to rock it with our newest addition, come Valentine's Day! If you want in on these pretties from Vintage Lace (check out all their other prints running this round too! ), join their facebook group, or order on their website.